A 40,000 square foot office building in southern California was severely damaged by the 1994 Loma Prieta earthquake. Water intrusion was caused by breaches in the roof, separation of the tilt-up walls, and broken sprinkler pipes. The building was unsafe and remained sealed for months, resulting in a massive mold contamination. 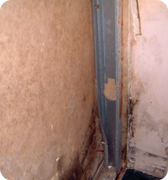 Prior to our involvement, the mold contamination prevented access for structural stabilization work. The project was at impasse, mold remediation workers could not enter the building because it was structurally unstable, structural stabilization workers could not enter the building because of the mold. We performed survey and sampling in the building to locate mold contamination and characterize the environment. This allowed us to develop worker protection procedures and localized mold control procedures that allowed cost-effective access for structural stabilization of the building, and economical removal of mold contaminated materials.